The $20 a barrel price plunge, which began in early October, continued last week with New York futures closing at $56.46 and London at $66.76. Behind the drop is weaker demand; Washington’s issuance of waivers that would allow Iran to keep exporting at least some of its production for the next six months; increasing production of US shale oil; and the rapid buildup of US crude inventories. The EIA reported last week that the US crude stockpile climbed by 10.3 million barrels during the week before last to 442.1 million barrels, the highest level since early December 2017. The EIA also reported that US crude production climbed by 100,000 b/d to 11.7 million b/d, the highest on record. One reason behind the large buildup of the US crude inventory is that in response to the Sino/US trade war, China has stopped buying US crude. Earlier this year Beijing was importing at around 500,000 b/d. The very light crude that comes from shale oil deposits is not suitable for use in many US refineries which were designed to process heavier grades. 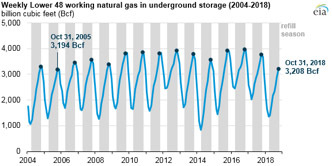 As there is a limited market for shale oil in the US, it winds up in storage unless it can be exported. Another aspect of the shale oil boom is that global oil markets are increasingly over-supplied with light distillates, such as gasoline, while there are not enough middle distillates, such as diesel. To keep meeting the demand for distillates, refiners are processing high volumes of crude and creating a glut of gasoline. U.S. gasoline prices for delivery in June 2019 are trading just $7 per barrel above benchmark Brent futures for the same month, compared with a premium of $18 per barrel for low-sulfur distillate fuel oil. Until the recent price drop, major oil companies were doing well, yet there was no surge in the money they were spending on large offshore projects that will produce the oil needed in the mid-2020s. Instead, several major oil companies have been investing in shale oil projects which can provide returns in months, provided they can use their expertise to keep costs under control. 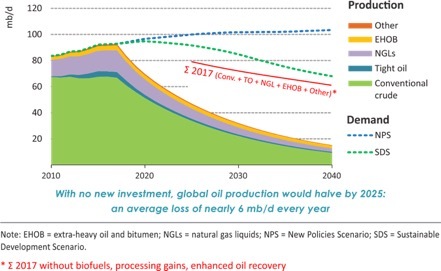 Wood Mac’s analysts are forecasting that in the next 12 years, large oil companies would need to add 16 million b/d to their combined daily production to be able to respond to demand and replace depleted deposits. This means several hundred new projects that cannot all be in the Permian Basin. OPEC: The cartel and its allies have all but decided to cut oil production in 2019 to shore up what they see as a weak market ahead. Getting agreement among the 25 members of the OPEC/non-OPEC coalition with their competing agendas, domestic considerations, and geopolitical rivalries will not be an easy task. The group next meets December 6-7 in Vienna, and discussions have already begun on those particulars, delegates say, with talk that between 1 million and 1.4 million b/d may need to be slashed. OPEC is a different organization than it was two years ago, the last time it agreed to output cuts. Some members have boosted production, others have shrunk. Libya and Nigeria, suffering from internal disruptions, were not given quotas when the coalition instituted 1.8 million b/d in cuts starting January 2017, while Iran was given a cap slightly above its production level at the time. Production from Libya has risen 580,000 b/d from the October 2016 baseline on which the cuts were based, and Nigerian output has risen 120,000 b/d. Venezuelan production has dropped precipitously and may be close to complete collapse. Some OPEC members are saying that Saudi Arabia and Russia, both of whom have boosted their crude output in recent months, were responsible for a $20 a barrel drop in the price of oil and “should cut at least 1 million b/d instantly.” The two countries, the largest producers in the OPEC/non-OPEC coalition, needed to “get back the loss that they caused” to the rest of the coalition, one OPEC delegate said on condition of anonymity. Moscow is already saying it is not interested in participating in a production cut at this time. US Shale Oil Production: US crude oil output from the seven major shale basins is expected to hit a record of 7.94 million b/d in December, according to the monthly EIA forecast released last week. The total oil output from the seven basins is forecast to rise by 113,000 b/d from November to December, driven largely by increases in the Permian Basin of Texas and New Mexico, where output was forecast to climb by 63,000 b/d to about 3.7 million b/d in December. Output was also expected to rise in each of the other basins, except for the Haynesville, where it would remain unchanged at 43,000 b/d. US natural gas production, meanwhile, was projected to increase to a record 75.1 billion cubic feet. The announcement that some drilling in the Bakken is moving away from the “core” areas to less productive counties marks a major shift in the history of the Bakken. Whether drillers can compensate for “poorer rock” with three-mile laterals, more sand, and more water remains to be seen. 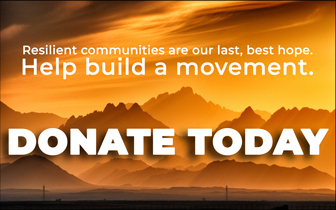 The Bakken may have reached a tipping point. Optimism about the future of US shale oil production continues to run rampant in the ranks of the official and unofficial forecasters. According to the IEA, “The shale revolution continues to shake up oil and gas supply, enabling the US to pull away from the rest of the field as the world’s largest oil and gas producer. By 2025, nearly every fifth barrel of oil and every fourth cubic meter of gas in the world come from the United States.” The Wall Street Journal adds that the use of hydraulic fracturing to drill for oil in shale rock—known as fracking—has dramatically reshaped the global oil industry over the past decade, and it has allowed the US to rival the Organization of the Petroleum Exporting Countries for market share. If the skeptics are right that US shale oil production will not continue to grow at its present pace, we should see more evidence of an impending decline in US shale oil production within the next few years. The International Energy Agency which is an arm of the OECD is far more attuned to concerns in the EU and other developed countries than is the US Department of Energy’s EIA which generally hones its analysis to the policies of the current administration. As a result the IEA’s annual publication, World Energy Outlook 2018, has a much broader perspective than the US government and digs into the dangers of climate change more deeply than does Washington. This year’s 600+ page report contains too much information and analysis to recount here. However, there are a few key points that are worth remembering. The Agency continues to warn that there is not enough investment taking place in oil industry. Although it is probably overly-optimistic about the prospects for the US shale industry it clearly understands that trillions must be invested in developing the world’s offshore oil resources in the next 20 years if global oil production is not going to go into decline. The IEA forecasts three scenarios for the world’s energy. The “Current Policies Scenario” results in large increases in the use of fossil fuels and CO2 emissions over the next 20 years. The “New Policies Scenario” takes into account pledges to reduce emissions made at the Paris climate change meeting. Finally, the “Sustainable Development Scenario” envisions a reduction in annual carbon emissions from the current 32.6 gigatons to 17.6 gigatons. This scenario envisions the use of coal being cut by 50 percent, oil use being reduced by 25 percent, and use of natural gas increasing by 20 percent, while the use of renewables, nuclear power, and hydro increase substantially. Iran: It has been two weeks since the US re-imposed sanctions against Iran’s oil exports to punish Tehran for its involvement in several Middle Eastern conflicts. To avoid an oil price spike, Washington granted Iran’s biggest buyers – China, India, South Korea, Japan, Italy, Greece, Taiwan, and Turkey – 180-day sanctions waivers. These countries account for about 75 percent of Iran’s oil exports. Washington and the recipients of the waivers except for Turkey have not disclosed how much oil they are allowed to import during the 6-month waiver. Iraq, which imports natural gas and electricity from Iran, was given a 45-day waiver to continue these imports. Iraq has a severe electricity shortage in the oil-producing region around Basra, and it will be difficult for Baghdad to replace the Iranian energy. Iraq ended its trucked crude to Iran nearly a month ago, leading Washington to issue its waiver for the ongoing gas and power trade between the two countries. Bernstein Energy forecasts, “Iranian exports will average 1.4-1.5 million b/d” during the exemption period,” down from a peak of almost 3 million in mid-2018. However, people familiar with the sanction waivers say American officials are forecasting that there will only be some 900,000 b/d of Iranian crude sales by April. Reuters’ sources say that China is allowed to purchase 360,000 b/d during the waiver period which is down from an average of 655,000 b/d before the sanctions began. Several countries, including China and India, stepped up their purchases before the imposition of the sanctions. Most observers believe that the sanctions will send Iran into an economic recession, especially with the recent $20 a barrel drop in oil prices. Whether the sanctions will result in the economic meltdown that the Trump administration hopes will bring Tehran to accept tougher restrictions on its nuclear activity, drop its ballistic missile program and scale back support for militant proxies in the various Middle East conflicts remains to be seen. The EU does not agree with Washington sanctions policy and is working on ways to help Tehran bypass the sanctions. Last week, Iraq restarted exports of Kirkuk oil, halted a year ago due to a standoff between the central government and the Kurdistan’s semi-autonomous region. The flow of oil from the Kirkuk region resumed at around 50,000-60,000 b/d compared with a peak of 300,000 b/d seen last year. It is not clear when and by how much exports would rise. Oil Minister Thamir Ghadhban, a longtime proponent of reconstituting an Iraqi National Oil Company, is pushing the Iraqi Cabinet to redraft a more comprehensive law to govern the company. Iraq’s Parliament passed a law in March for a national oil company, such as the one which was founded in 1964 and disbanded in 1987 by Saddam Hussein. The new company would assume operational authority over the oil sector, leaving the Oil Ministry to establish policies. With the recent successes of the Moscow-backed Syrian government forces, there has been an influx of militants from Syria into Iraq. This is forcing Iraqi security forces to transition into a counter-insurgency mode from the conventional war they have been fighting against ISIS. Iraq’s persistent security problems have caused the US military to conclude it is “years, if not decades” away from being able to withdraw from the country. Saudi Arabia: When the US asked Saudi Arabia last summer to raise oil production to compensate for lower crude exports from Iran, Riyadh swiftly told Washington it would do so. But Saudi Arabia did not receive a warning when the US began offering waivers to Iran’s major customers that are keeping more Iranian crude on the market. As a result, the angry Saudis are cutting output with OPEC and its allies by about 1.4 million b/d sources told Reuters this week. The Saudis started to reduce shipments to the US in September, and this month they are loading around 600,000 b/d on cargoes for the United States, down from more than 1 million b/d in July and August. According to ClipperData estimates, Saudi oil exports to the US could soon reach their lowest levels on record. There is a debate going on inside the Saudi government over whether to leave the OPEC someday. The Organization was created 58 years ago mostly to counter very cheap oil prices, which were being fixed by Western oil companies. Since then the cartel has weathered many crises and has played a major role in affecting world oil prices. A significant change came three years ago when Russia, along with several client states, became a de facto member and was successful in pushing up oil prices by withholding production from the market. In reality, most OPEC members do not have much influence on world prices and have small, and in several cases, shrinking oil industries. The duumvirate of Moscow and Riyadh along with their clients such as the Gulf Arab states control enough of the global export market to exert whatever influence on prices is needed without the need to take into account the needs of the smaller and less well-off exporters who are mainly interested in higher prices. The growing split between Iran and the Sunni oil exporters is another factor in the viability of OPEC. For now, the organization seems safe but and some are already looking beyond the oil age. Saudi Aramco has approached banks to finance its $5 billion Amiral petrochemical project that Aramco plans to develop with France’s Total. Plans for the Amiral petrochemical complex in the Saudi city of Jubail were announced in April. It will be located next to the Satorp refinery, which is also jointly owned and operated by Aramco and Total. China is expected to increase its economic stimulus programs after credit grew at its slowest pace on record last month and property sales contracted. Beijing is concerned about slowing economic growth ahead of the expected US tariffs. Its central bank has already loosened monetary policy in response to the growth slowdown. Chinese exports have remained strong so far this year, despite the US imposition of duties on $250 billions of Chinese goods, but an export slowdown is expected to appear by early next year. Passenger-car sales in China have fallen for the past four months year-over-year and are on course to an annual decline for the first time in nearly three decades. Most automakers, foreign and domestic, are struggling. Ford Motor Co.’s passenger-car sales in China were down 45 percent in the first nine months of the year, while sales of the Fiat Chrysler Automobiles NV-owned Jeep fell 35 percent, and General Motors Co.’s Buick sales were down 9 percent, according to LMC Automotive. Only the high end of the market has seen consistent growth, with Cadillac sales up 30 percent in the first nine months of 2018, and the German trio of Audi, BMW and Mercedes-Benz all growing by 10 to 13 percent over the same period. China’s crude oil imports averaged 9.7 million b/d last month, the highest on record. Once again, it was the independent refiners, or teapots, that drove the increase as they seek to fulfill their import quotas before they expire. Beijing announced it would raise by 42 percent the oil import quota for its non-state refiners for 2019 as new refinery capacity is planned to enter into operation next year. Chinese refineries processed an average of 12.43 million b/d last month, a little lower than the September record of 12.49 million but still the second-highest monthly throughput rate on record according to data from the National Bureau of Statistics. As the world’s second largest LNG importer, China has ramped up preparation for the upcoming winter through early procurement plans and a series of new gas infrastructure projects. Stable central Asian pipeline imports will depress China’s need for LNG spot cargoes in the coming months, as the country officially enters the winter season this week. Centralized heating systems in the north will be switched on until March to counter a region-wide drop in temperatures. State planner, the National Development and Reform Commission, has pledged there will be enough gas supply to the residential areas this winter to avoid a repeat of last year’s winter gas shortage. Moscow wants to stay out of any oil-production cuts being pushed by some of its partners in the OPEC-led supply consortium. Worried by a decline in oil prices due to slowing demand and record supply from Saudi Arabia, Russia, and the United States, OPEC is talking about a policy shift just months after increasing production. President Putin on Thursday avoided giving a direct answer on whether production should be limited but said he had discussed the situation in global oil markets with President Trump. Russia has been pumping flat out since June and has returned to drilling new fields, raising production to a post-Soviet high of 11.5m b/d as part of an agreement with Riyadh to keep oil markets well supplied. Riyadh is said to be pushing Moscow to consider cutting back output in 2019 to help underpin prices and keep the market balanced. But Russia is said to be hesitant at this stage to agree to cuts. Its oil companies want to start up new production which has been stymied for the past two years by Moscow’s alliance with Riyadh. Moscow can still add between 200,000 and 300,000 b/d in a short time period — within several months,” one of the people said but added it depended on future decisions with its allies in OPEC. Nigeria will raise its crude oil production to 1.8 million b/d in 2019 from around 1.6 million currently, the head of the Nigerian National Petroleum Corporation told Reuters last week. Following a wave of militant violence in 2016 and early 2017, Nigeria’s oil production started to recover in the latter half of 2017, when attacks on oil infrastructure subsided. This year, after pipeline outages during the spring and early summer, Nigeria’s crude oil production was on the rise in August and September, but oil ministry data showed last week that October’s output down by some 70,000 b/d compared to September, due to increased sabotage attacks on oil infrastructure by oil thieves. Shell Petroleum Development Company last week complained about the high rate of vandalism on its pipeline network at its oilfields in Bayelsa resulting in oil leaks and pollution of the environment. The oil firm expressed regrets at the incessant spills and is committed to maintaining environmentally sustainable operations. He said that although the May 17 oil spill on the Trans Ramos Pipeline was traced to equipment failure, many other leaks were predominantly caused by sabotage; during April and May 26 spill incidents were reported on that line and out of these 18 were caused by sabotage and eight were operational. Oil Minister Kachikwu was even more optimistic saying that Nigerian oil production is set for a timely boost, climbing to around 2.2 million b/d by early next year with the startup of the giant Egina offshore oil field. Nigeria has not seen any major new oil projects in the last five years which makes the Total-operated Egina project the key to increasing production. The $16 billion deepwater project is the biggest oil and gas investment in Nigeria and will boost its plateauing crude production by over 10 percent. Production from the Egina field is due to start next month at around 150,000 b/d and could ramp up to 200,000 b/d after about six months. The Nigerian Senate announced last week it again uncovered illegal withdrawals of $1.15 billion from the dividends accounts of the Nigeria Liquefied Natural Gas by the Nigeria National Petroleum Corporation. This is apart from the $1.05 billion that National Petroleum had admitted to taking earlier. Crude oil production in Venezuela “is in free fall”, Fatih Birol, Executive Director of IEA, told Reuters last week. Its oil production fell to just 1.197 million b/d in September, down 42,000 b/d from a month earlier. However, because things are deteriorating so quickly, that figure is now out of date. With a few weeks left in 2018, many analysts believe production could be below 1 million b/d. Venezuela’s oil exports to the United States declined by 19 percent in October, compared to a month earlier. The decline came as a result of maintenance from the country’s upgraders, which turn heavy oil from the Orinoco Belt into exportable forms of oil. Without the ability to process the Orinoco oil, exports plunged. For nearly a century, Chevron has had close relations with Caracas and has earned big money in Venezuela—about $2.8 billion between 2004 and 2014, according to cash-flow estimates by analytics firm GlobalData. Recently, executives at the last major US oil company in the country have debated whether it may be time to get out, according to people familiar with their deliberations. The company is well aware a pullout could trigger a collapse of the government’s finances because a significant chunk of its hard currency earnings comes from joint operations with Chevron. By staying in the country as its economic and humanitarian crises deepen, the company risks damage to its reputation by being seen as supporting an authoritarian regime sanctioned by the US government. It also isn’t making much money in Venezuela anymore. About 700,000 b/d of the country’s oil production comes from joint ventures between PdVSA and foreign companies. That includes about 200,000 to 250,000 b/d from Chevron ventures. Joint-venture output has generated far more cash for the government in recent years than oil pumped by PdVSA alone because the company’s production has gone to repay debts to allies such as China and Russia or was processed into gasoline the government provides almost free. That means a Chevron withdrawal would take a big bite out of the government’s revenue. Drivers are reporting long queues to fill their tanks in Venezuela’s western states, as existing gasoline shortages worsened, impacting at least half of Venezuela’s 24 regions. In some provinces, lines extended for over ten hours. Public transport and commercial distribution networks have also been affected. Government spokespeople blamed the situation ─ which in some states such as Barinas and Merida have persisted with fluctuating severity for nearly three weeks ─ on supply problems of imported catalysts used in the Paraguana oil refinery complex. Venezuela has problems importing many goods partly due to US-led financial sanctions which prohibit US citizens and firms from dealings in Venezuelan sovereign and state oil company debt. The sanctions have been felt in US-dominated global financial and banking sectors which process international commercial transactions, with the Caracas government denouncing numerous cases of frozen bank accounts and interrupted payments. The measures have also caused significant problems for Venezuela’s nationalized oil firm, PDVSA, which has been prevented from repatriating a reported $1 billion in annual profits generated by its US-based subsidiary, CITGO, as well as vital products produced there such as diluents used in crude processing in Venezuela’s refineries. Independent estimates suggest that Washington’s sanctions have to date cost Venezuela $6 billion in lost oil revenues due to falling production, seriously exacerbating budget shortages and lack of investment in the country’s oil industry.